Callie lost her parents when the Spore Wars wiped out everyone between the ages of twenty and sixty. She and her little brother, Tyler, go on the run, living as squatters with their friend Michael and fighting off renegades who would kill them for a cookie. Callie’s only hope is Prime Destinations, a disturbing place in Beverly Hills run by a mysterious figure known as the Old Man. He hires teens to rent their bodies to Enders—seniors who want to be young again. Callie, desperate for the money that will keep her, Tyler, and Michael alive, agrees to be a donor. But the neurochip they place in Callie’s head malfunctions and she wakes up in the life of her renter. Callie soon discovers that her renter intends to do more than party—and that Prime Destinations’ plans are more evil than she could ever have imagined. . . .
Includes Portrait of a Spore, a never-before-published short story that takes place in the world of STARTERS. LISSA PRICE is the award-winning international bestselling author of STARTERS, published in over thirty countries, and ENDERS. She has lived in India and Japan but now resides in Los Angeles. You can visit her at www.LissaPrice.com and follow her on Twitter at @Lissa_Price and Facebook at @LissaPriceAuthor. "The only thing better than a terrific concept is one that is as well executed as Starters. Readers who have been waiting for a worthy successor to Suzanne Collins' The Hunger Games will find it here. Dystopian sci-fi at its best, Starters is terrific series kickoff with a didn't-see-that-coming conclusion that will leave readers on the edges of their seats." 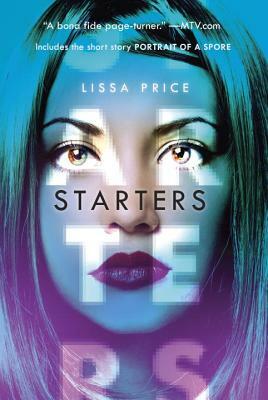 "Built up to a dramatic climax and a stunning twist, Starters is an addictive and alluring tale about human nature's darker side, and how far we'll go to get what we want. Readers everywhere will want to dive right in, and Hunger Games fans especially will find themselves hooked." "This story of those who are not what they seem twists along with multiple-identity switcheroos and chase scenes worthy of a Hollywood blockbuster . . . The inevitable sequel can’t appear soon enough." "Constantly rising stakes keep this debut intense." "Intriguing, fast-paced . . . Fans of dystopian novels will be completely engaged and clamoring for the sequel."